Have you been ready to welcome the new Swords and Sandals world? Now, it has come to the new version of Swords and Sandals 4: Tavern Quest. You will be welcomed with new skin, features, characters and high quality graphics than previous game. Discover the new combat game of this Swords and Sandals 4 unblocked. Other than new high quality skin, the most interesting feature is 23 minigames hall to earn more gold that unlocked every 3 level up. Now, you are not playing alone anymore, but you can ask your friends to join up to 4 human players. The characters are also improved than can be selected by class including Mage, Paladin, Bards, and Fighters. While you’re playing, you can find various tiles with different advantages such as ‘gain gold’ that gives you 10 gold, ‘treasure chest’ that gives you 50-100 gold, and many more. 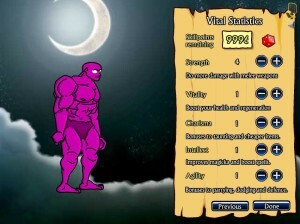 In the shop, you will also find more hundred new stuffs to improve your combat’s abilities. In the full version of the game, player can combat up to level 75 and beyond. Create your character, choose the skills, defeat the opponent, play the minigames, and be the champion. Good luck on your combat!